How do I best prepare? This year’s lecture, held at St. John Cathedral Center, was attended by almost 90 people including Metropolitan William Skurla, faculty, staff, seminarians, graduates and members of the Board of Directors of the Seminary. Aphrahat the Persian sage is the earliest writer in Christian Syriac of whom we have proof. Writing in the 330s and 340s in the vicinity of modern Iraqi Kurdistan, his works are notable for their relative freedom from the lexicon and thought world of Greek philosophy; neither does he appear to know any prominent, pre-Nicene Church Fathers. Although unacquainted with Greek and Latin patristic literature, Aphrahat clearly possessed considerable authority in the Church of the Persian Empire. Archbishop Alexander will examine the portrait Aphrahat paints of the holy man in his fourteenth Demonstration. The idea of transformation, of becoming divine, is clearly central to Aphrahat. While the language of the Greek Fathers’ theosis is absent, he phrases it in an idiom much more akin to that of Second Temple apocalypses, and of the later Jewish Ezekial chariot-throne mystics of whom he was a likely contemporary. 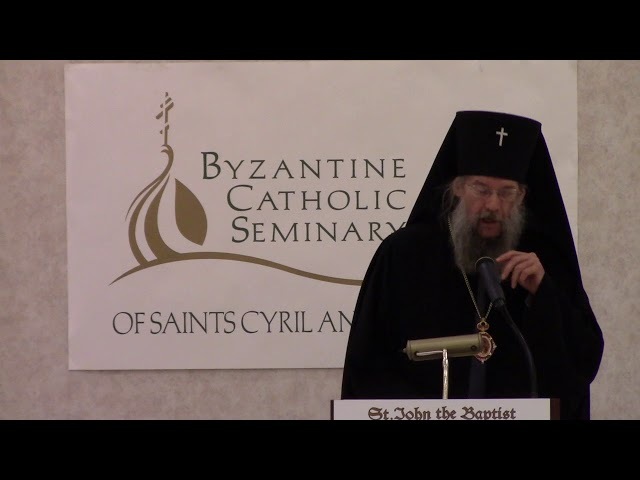 The annual lecture series is sponsored by the Byzantine Catholic Seminary of Ss. Cyril and Methodius, a community of mentors, teachers, and students forming leaders for the Church in an environment of Christian unity, integrity, and missionary spirit, with a commitment to ecumenism. This year’s lecture was followed by a question and answer period. A reception followed the lecture.